The long wait is over. Microsoft finally announces new flagship smartphones - the Lumia 950 XL and Lumia 950. Both rock the flashy Windows 10 Mobile Software! Get all he deets here! After over a year of waiting, Microsoft releases new flagship devices for its growing portfolio of popular smartphones. This year, the new crop includes the Lumia 950 and the Lumia 950 XL. Let's not keep you waiting, check out these devices right after the fold. 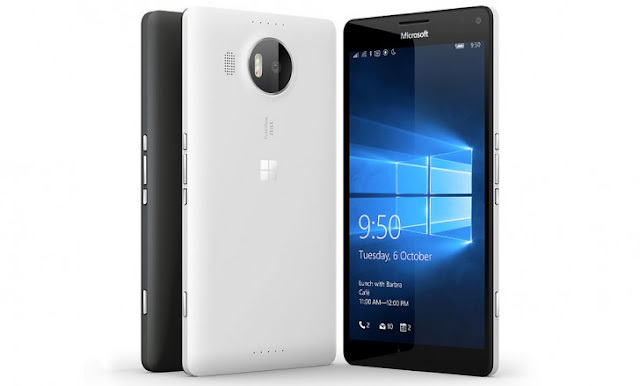 The Lumia 950 XL is a 5.7-inch Quad HD device with AMOLED display panel. It packs more power compared to the 950 in terms of performance. The handset is driven by a Snapdragon 810 chipset with a cluster of four Cortex A57 cores at 2GHz speed and another set of four Cortex A53 CPUs running at 1.5GHz. The 3GB of RAM will make app launching and multitasking zippy. There's also an Adreno 430 GPU for graphics. And if you've been nitpicky about the Snapdragon 810 performance, Microsoft has patched its possible overheating issues with a Liquid Cooling solution. Battery-wise, the Redmond company issued a 3340 mAh capacity which is fairly big compared to other flagship battery packs. There's also a Qi wireless charging in tow. The USD Type C will also allow users to charge up to 50 percent in just 30 minutes. The PureView camera has also been invigorated with 20MP Carl Zeiss optics and f/1.9 lens. It is supported with a 5th-gen OIS and triple-LED flash for shaky and lowlight environments. The selfie shooter is a 5MP camera coupled with its own LED flash. The software company introduces the Display Dock which allows Continuum function. Basically, the dock is a box with one HDMI, one display port and three USBs intended for accessories. Likewise, Microsoft also introduces the Windows Hello for Iris scanning capability using the front camera. The Lumia 950 XL costs USD 650. The Lumia 950 replaces the Lumia 930 if we are to talk about succession. It comes in a 5.2-inch QHD AMOLED display which enforces Glance and ClearBlack features. The Lumia 950 is clearly a compact Lumia 950 XL; in fact, both come with similar hardware. On paper, the Lumia 950 is powered by a 64-bit Snapdragon 808 under the hood. Talking about memory, the handset packs a beefy 3GB of RAM coupled with 32GB of native storage, expandable thru a microSD card slot. For photography buff, PureView camera has never been this pumped-up before. It comes with the inclusion of 20MP sensor with 5th-generation optical image stabilization and Carl Zeiss optics. The sensor is also supported by the triple LED flash for lowlight environment. Flipping the device, the front panel houses the 5MP front shooter which is capable of 1080p stills. The Lumia 950 throws in a juicy 3000 mAh battery with Qi wireless charging capability. Other notable features are the Iris Scanner and the Microsoft Display Dock. The Lumia 950 will have an asking price of USD 550 upon its November launch.